Majority Leader of People’s Majlis, Vilimale’ MP Ahmed Nihan Hussain Manik has appealed to the public to plead with lawmakers to attend Majlis sittings, referring to recent boycotts by opposition lawmakers. 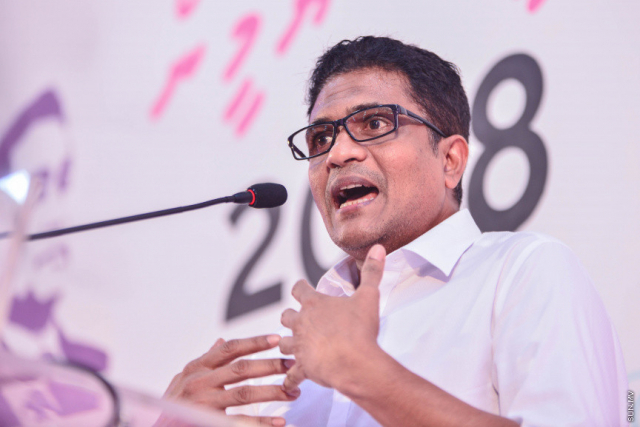 Speaking at a press conference by ruling Progressive Party of Maldives (PPM) last Wednesday night, Nihan said the Majlis had some important work scheduled. “I plead with the people of Maldives, please help put an end to this refusal by MPs elected by you to attend Majlis sittings,” said Nihan. He said that lawmakers from the government coalition – PPM and Maldives Development Alliance (MDA) attended regular Majlis sittings to serve the people. Nihan said the current session, which began last Thursday night, has some important legislative work pending, including reforms to the Criminal Procedure Code and Civil Procedure Code. Opposition lawmakers boycotted the extraordinary Majlis sittings on Monday and Tuesday to pass the extension to State of Emergency, and the first sitting of the first session for the year 2018, held at Dharubaaruge last Wednesday night. The opposition lawmakers have called both the recent extraordinary sittings and Wednesday night’s sitting, in which President Abdulla Yameen Abdul Gayoom delivered his address to the Majlis, unconstitutional.